For every one of your loving children, grandchildren or even great grandchildren, there's a special birthstone to remind you of them! Choose the pendant design and birthstones to suit your family. Keep your family close to your heart! Custom made in Ireland. Gift certificates are also available for your customized gift. Sample 1, 2, 3, 4, 5 and 6 arrangements. You create your own! 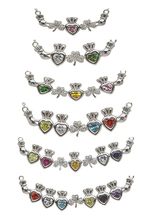 Step 2 - Select birthstone months to represent members of your family. 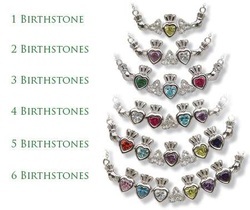 Select the birthstones in the order as viewed on the wearer. Click here to read more about what each birthstone represents. Step 3 - Submit you order using the order form below. Note: If you have any queries relating to ordering process for this product, contact us Mon. to Sat. 10.30am to 5.30pm (516-8262574) . This product is handmade in Ireland. We provide FREE SHIPPING on all items purchased through our Website within the US and delivered via Standard Ground. To clean, use a solution of lukewarm soapy water. With a soft tooth brush gently brush the Mother's Family Pendant with the solution and rinse in clean water before drying with a lint free cloth. To remove caked on dirt, first immerse the item in lukewarm soap water for a few minutes before brushing, rinsing and drying (as above).